You've heard of the Million Man March on Washington, DC? How about a "Million Genealogists March" to index the 1940 US census? March right up to your computer desk and sign up to index now at www.the1940census.com. According to US Census Bureau stats reported at the1940 US Census Project, there were 132 million people living in in the US in 1940. If there are 132 million people to index, here's how the indexing project will shake down. Each name must be indexed TWICE to ensure a quality index is created, so that's 264 million entries. ARBITRATION compares and resolves keystroke differences. Let's say this happens 10% of the time, based on my personal experience arbitrating earlier census records at FamilySearch Indexing. LET'S SAY THE AVERAGE PERSON INDEXES 10 names per day, or 70 names per week, then 1 million indexers could do this in 29 days days. Right now, according to Jim Erickson of FamilySearch, there are an average of 21,000 indexers submitting work each day. That's up from 8,000 in early January, but it is no where near the number of indexers needed to roll out the 1940 index on a timely basis. LET'S GET SERIOUS and say that 1 million indexers could do this in 2.9 days if they index 100 names per day. 100 names per day isn't difficult. In previous census indexing I've done, that is roughly 2 pages of the census. OK, let's get this straight. 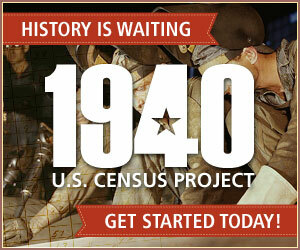 However we decide to crunch the projection numbers, the 1940 US Census Project needs volunteers. Most genealogy society members are using the internet, but what about those who aren't yet? What about the FAN - family, friends and neighbors of each society member? Our circle of influence is larger than we realize, and now is the time to corral all that talent to get the job done starting on day one. The 1940 Census Project will notify you between 2-27 of April 2012 when your preferred state is available to index. How many different sites are doing the indexing? I've seen stuff from Family History, Ancestry, and others. Are they combining the efforts or all seperate? This project is quite unusual in that three genealogy entities have partnered to work together -- namely FamilySearch.org, BrightSolid (owner of FindMyPast and ScotlandsPeople.gov.uk, etc.) and Archives.com. I've heard Ancestry.com was invited to participate, but they declined. NOTE: Prior to this, I've always been reticent to consider Archives.com as anything more than a genealogy search portal, since so much of what they offer in search results is found free elsewhere on the web. However, Archives.com is the company that won the contract with NARA to host the images of the 1940 census. That website is www.1940census.archives.gov and it will provide the images on 2 April 2012 at 9 am Eastern. It remains to be seen if Archives.com is up to the task, and can handle the tremendous load on the servers when genealogists descend on the site. Since the images won't be indexed, we'll each be spending more time looking for each ancestor than when searching indexed sites. The 1940 census project will definitely be indexed using the current FamilySearch indexing program, which you can start learning now by indexing other projects. Just go to indexing.familysearch.org or www.familysearch.org/volunteer/indexing to download the software. Click "Get Started" to get to the download page. FamilySearch is encouraging everyone to come start indexing now so they can be ready to start indexing the census on April 2nd. Just 27 days left! Can't wait! Thanks for getting more people involved. The more people who march over and help index, the faster the census will be made searchable by name.